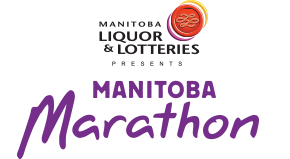 Manitoba Marathon’s core strength has long been that families participate together on race weekend, either as runners or as volunteers. Jennifer and Nikolaus Reichert are a great example of how families can use their individual strengths and skills to significantly contribute on race day: they arrive together on race morning and both head off to their jobs, Nikolaus on the course and Jennifer in the stadium. Born and raised in Winnipeg, Jennifer has always been active in the athletic community, playing softball, ringette and golf from an early age. She is a busy hairstylist and a brand educator for an international product line. In her free time, she enjoys taking her two tiny poodles on a nice summer walk with her son Nikolaus. Nikolaus is a 12th grade student at Collège Garden City Collegiate that not only has a passion for science and technology, but also for volunteering. This passion sees him using his free time to lead various extracurricular science groups at his high school. At home, he is an Amateur Radio operator and electronics hobbyist. When did you first start volunteering with Manitoba Marathon and what initially got you involved? Jennifer: Through the years I have volunteered at different sporting events. The Manitoba Marathon was one that was always on my list. A good friend recently became a coordinator for the event, and I knew that I wanted to help her make it a success, so I began volunteering three years ago. I also knew that it would be a great way to volunteer alongside my son. Nikolaus: Through my hobbies, I learned that Amateur Radio Operators are responsible for managing communications during the event. Excited to incorporate volunteering into my hobby, I approached Jeff Dovyak (head of the Winnipeg Amateur Radio Emergency Service (WARES)) and began to volunteer as a part of the WARES team in 2017. What job do you do on race day? What do you particularly enjoy about that position? Jennifer: I work in the stadium merchandise kiosk doing everything from setup to inventory, pricing and sales with one other volunteer. I also give input on the popularity of items, making suggestions on what is likely needed for next year. I come from a retail-sales background, so I find this job second nature to me. I really enjoy my time in this position: I am able to talk with everybody from family members to onlookers and help them find special keepsakes for their big day. Nikolaus: As an Amateur Radio Operator, my job has been to co-ordinate communications between the various medical, hospitality, and event official teams during race day. Reporting to the Communications Centre, I work alongside another operator conveying runner placements and emergencies as well as with the course medical team in monitoring weather conditions and ensuring participant safety. Jennifer: Race day is always a happy day – being able to see the accomplishments of these athletes is admirable. Between the kids completing the Super Run, and rest of the runners coming across the finish line, It is inspiring to see such determination. Nikolaus: I am incredibly motivated by my ability to utilize my hobbies in a way that is beneficial to others. It is great to be able to work alongside fellow radio operators that share the same drive. What is it like to work together as a family on race day? Jennifer: Although Nikolaus and I work in entirely different jobs on race day, we still do the same routine each year keeping in touch and coordinating during the event. For example, if Nikolaus is closing one of the last miles, I know that there will be family members coming to buy merchandise at the finish line. What do you think is the most important skills that you have both gained volunteering with the Marathon? How has your volunteer work influenced other areas of your life? Jennifer: Working at the Marathon has taught me how to better prioritize tasks in such a fast-moving environment, but also to have patience. Nikolaus: Working with the Manitoba Marathon and WARES was a great way to hone my communication skills. In my position, I am required to speak on the radio in a manner that is clear, concise and standardized. This of course is important in my hobby, as emergency communications is one of the largest segments of Amateur Radio. What is the most important advice you could give to new volunteers with the Marathon? Jennifer: To feed off of the positivity at the event and most importantly, have fun! Nikolaus: Never give up attempting a new task. Also as the last runners are crossing the finish line, key volunteers and staff are beginning to plan for next year’s run, so any feedback you can give them post-race [via the volunteer survey] help immensely with that planning.